Use your own LCD monitors for the best timing and scoring system possible without breaking the bank! Are you looking for a way to make your trivia night the talk of the town? 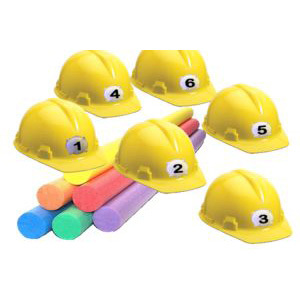 Are you seeking equipment to maximize your customer’s enjoyment and place them at the forefront of the trivia event? 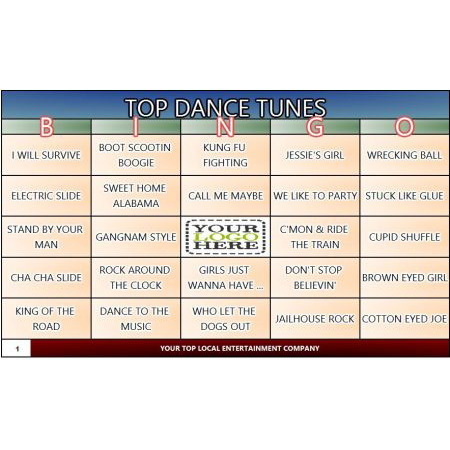 Do you want to give your trivia event that special "live game show feel" that is going to have customers flocking back for more? Do you need more venue owners lining up to book your services? Then you have came to the right place…. 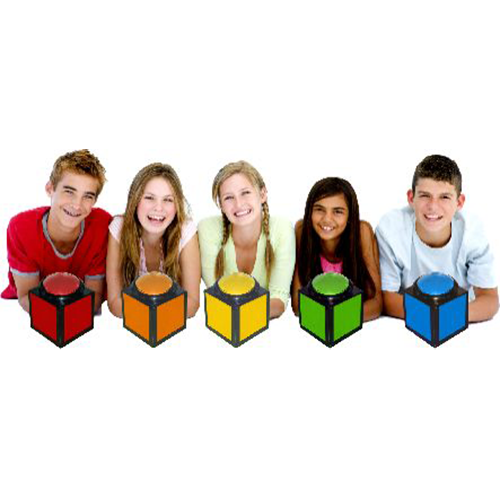 Building your own game show system has never been easier or more affordable! Within a matter of weeks you will start to see the profits roll in as customers being to flock to your quiz venues and venue owners increase the offers to get you as part of their team. The V-Station LE supports ANY monitor size. 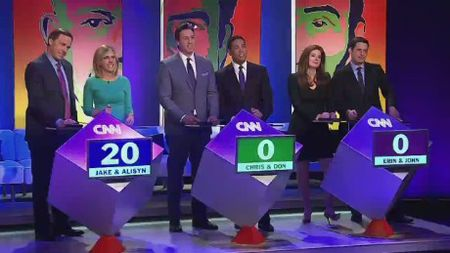 Build your own game show system by placing your LCD monitors on a table (depicted in picture above) or suspend them from trussing or other fixtures above each player or team to show their names and scores for all to see. Place the monitors in a stylish box or enclosure or console for added effect. When you build your own game show system you have full control of everything - positioning of the monitors, buzzers, lights and more. This means that you can create exactly what you have envisioned, or supply something that is expected by a certain client. 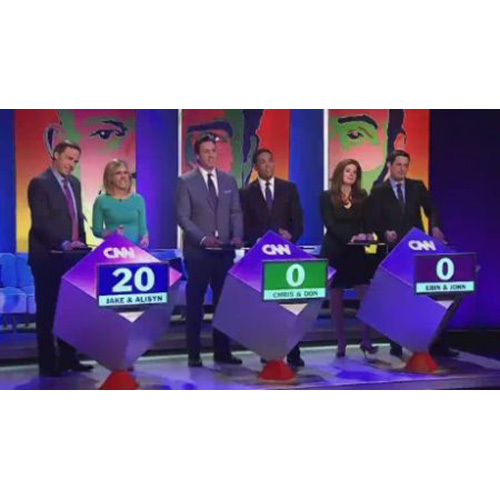 We have seen customer make 'fixed' podium styles, or 'folding' podiums. Others are using house TV's to connect the DIY box to. Mount the monitors horizontal (landscape mode) or even better yet use them vertically (portrait mode) for even a bigger effect. The possibilities are endless what you can do. Do you need a V-Station LE “Brain Box” for 3 players? No problem! 4 players? It’s a snap! Ask us about expansion for up to 16 players. It is easy to build your own game show system with V-Station LE technology. An expanded V-Station LE provides additional monitor outputs and extra buzzers for more participants. The V-Station LE support station is your first step in creating a unique and profit-boosting experience for you and your customers. 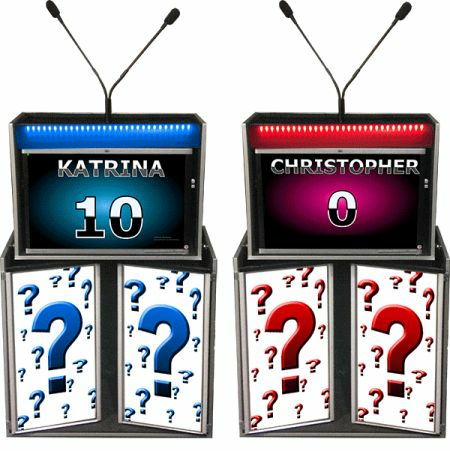 This product allows you to go that one step further by creating the game show feel in your trivia environment. Supporting LCD monitors of any size, they can be placed on tables or indeed hung above the teams and contestants….whatever suits! As with all DigiGames products they are professional, durable and reliable and will impress your customers with their stylish approach to presentation and indeed impress you with their affordability and usability. Likely you are handy with your own hammer and nails, or have a neighbor or a woodworking shop nearby that can build exactly what you want. Simply build your cabinet, mount in your monitors and let us do the rest. Our DIY box will then 'breathe life' into your own custom cabinet. 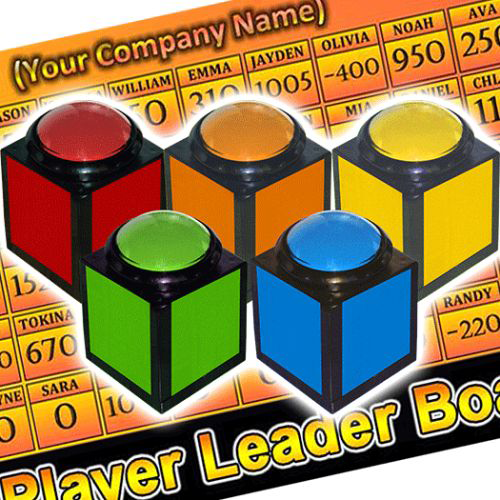 Mount the buzzers on top for players to buzz in and you are all set. Building your own game show system to save money means that you have a degree of freedom in how you operate. All products from DigiGames are customizable, meaning you can create a game show that suits your style and will please your audience. The only limit is your imagination and with the user-friendly approach of DigiGames systems you can be setting up even the most complicated game systems in a short amount of time! The possibilities are endless! 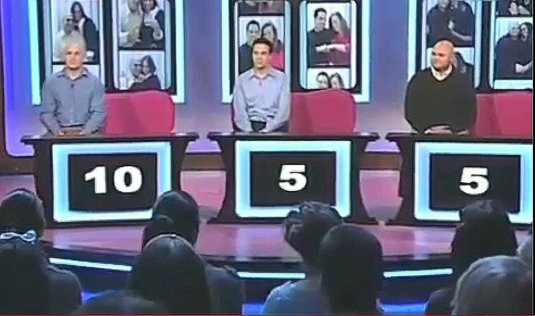 Save money with this DIY Game Show System. V-Station LE “Brain Box” – Complete with 2,3,4,5,6,7 or 8 VGA video ports. Wireless Remote – This does the basic functions like”Yes”, “No”, “Pass” for Stand-Alone operation but also allows you to customize fonts, font colors, background colors, background pictures…..and SO MUCH MORE!. Computer Data Interface Cable – Easy 1-cable connection from the V-Station LE to your laptop to use with the software games listed above. 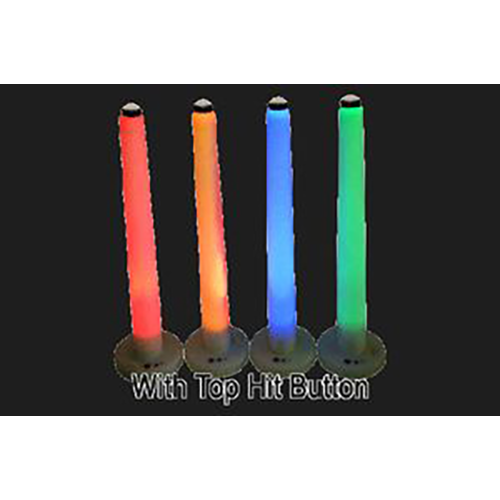 Wireless Buzzers – The entire buzzer lights up and flashes for a true game show experience. 30-day satisfaction guarantee – We know you will love your V-Station LE, but if not, just send it back to us within 30 days of receiving it. 1-year warranty – Did it break? Did you mess something up? No worries, we got you covered! 1. Ask a trivia question. 2. The quickest player will buzz in first. The system locks out the other buzzers and lights flash to identify who was first. 3. If the player was correct press "Y". If incorrect press "N". The player's score is adjusted accordingly. 4. At the end of the question session the player with the most points wins! Whether you are looking for 2 player game or a more elaborate game for up to 8 players, then we can provide systems with the VGA ports needed to have your game up and running. Built into the system are endless customization options, as you get with all DigiGames products, so whatever you wish to change from the font color, to the background pictures, to the display…it’s all easy to do and made so much more easier via the intuitive wireless remote that allows you to control system before, during and after gameplay! Connecting the V-Station LE to your computer system also opens up a whole new world of opportunities with innovative games from DigiGames such as Trivia Board Pro 4, Trivia Square and Trivia Feud all connectable as well as the vast range of innovative and interactive software in the DigiGames catalog. With a 30-Day satisfaction guarantee, a one year warranty and a dedicated support team on hand to assist you every step of the way, when it comes to systems such as the V-Station LE there should only be one place you should be looking and that is DigiGames. Wireless Remote (for Stand-Alone operation). 1 Wireless Buzzer per number of players ordered. 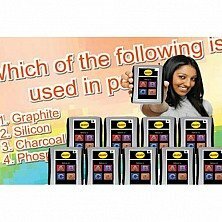 "Trivia Party Pack" software (for Computer Controlled operation) for 2 computers (Trivia Board Pro 4, Trivia Squares, Trivia Feud and Trivia Fortune).